Have you noticed that most conference presentations are boring AF? Me, too. And it makes me sad, ’cause everyone-breathing-in-the-same-room-education is one of my favorite things in the world. I approach every stage with a dare to outdo myself. That means past speeches have ended with my diving into the nearest pool with a group of fully-clothed attendees, a massive confetti battle aboard the historic Queen Mary ocean liner, and a standing ovation despite my having come down with the Moose Flu strep throat during a Canadian conference. So, if you want a speaker who doesn’t hop on the mic and bore the ever-loving shizbots out of everyone present with a rote presentation about the same old subject matter — featuring the same techniques everyone has been hawking since time (i.e. the internet) began — look no further. 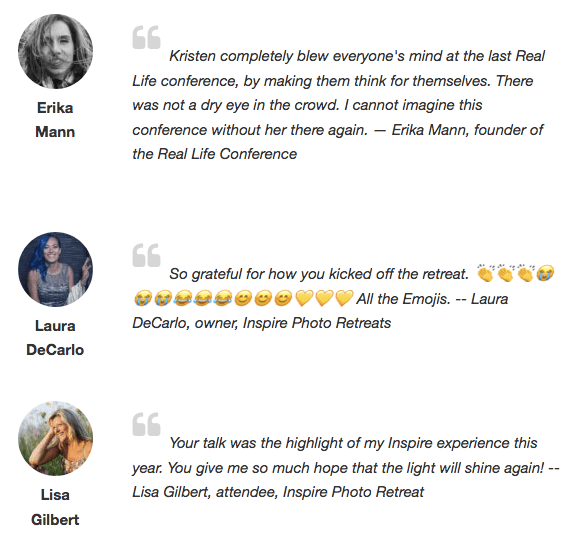 I’ve done speaking gigs, retreats, and workshops in 17 cities and in 6 countries around the world. Whether you want me to throw down about how vulnerability leads to profitability as an entrepreneur, fighting depression while running a business, or giving no fucks to what society desperately wants us to care about in the name of pursuing true work, I’m happy to help. Those are just a few topic ideas to begin our conversation. I don’t give the same speech twice, so a custom creation is yours for the taking! I take on 3 speaking gigs a year, and I’m now booking for 2019. Hop on that contact form and tell me how you see us working together, please!